Insects & Arachnids throughout the day – an assortment of butterflies, katydids, grasshoppers, beetles, crickets, etc. ; also several really cool arachnids on the trip through the National Park of Tortuguero. This was the most incredible day. Students saw more animals than most groups would see in a day. Many thanks to our guide, Mark Wainwright, and Justin, our boat driver from Tortuguero, who made this experience an incredible one for all course participants. TEXT BEING POSTED NOW … PICS TO FOLLOW … WE’RE HEADING OUT NOW ON A TURTLE WALK, WHERE WE HOPE TO SEE NESTING GREEN TURTLES!!! Today was an amazing day in Tortuguero! We started the day with a nature walk, and didn’t get very far from the Hotel Icaco http://www.hotelelicaco.com/when we came upon a myriad of bird species, butterfly species, and the industrious leaf cutter ants we have all come to admire. One of the points shared today by our MVI guide, Mark Wainwright, was that everything around us is shaped by evolution. Nothing in nature is random. Every organism has a purpose and a function in the ecosystem it inhabits. Each also has adaptations that have evolved to make it successful in its niche. Many of these adaptations include symbiotic relationships with other organisms, which we saw multiple examples of on our walk, such as the mutualistic relationship between ants and the fungus they feed the leaves to. We hope you enjoy the pictures from today’s walk, including some of the bird species such as the Social flycatcher Myiozetetes similis, Rufous-tailed hummingbird Amazilia tzacatl, Green-breasted mango Anthracothorax prevostii, and the Tropical kingbird Tyrannus melancholicus. After leaving the Hotel La Rosa de America, today’s trip (Day 2 after students arrived) was spent making the long bus ride to Tortuguero, but with a stop to sample fruit along the way, and learn about the amazing fruits that Costa Rica has to offer. After the fruit sampling, we finished our journey, and took the fun boat ride to the village of Tortuguero. Once students had lunch, and got settled in their rooms, we made a visit to the Sea Turtle Conservancy, for a 2 hour lecture on marine turtles, and conservation efforts going on in Tortuguero. It was an amazing talk, with students learning about the dangers marine turtles face, the marine turtle tagging and tracking being done by the STC, and ways everyone can protect marine turtles to prevent them from becoming endangered. It was an informative time spent together, and students will be going tomorrow night to hopefully see a marine Green turtle nesting. See the next post for updates on that! Apologies for this late post of our first day in Costa Rica. Uploading pictures has been a challenge, due to the bandwidth required to do so. Finally, we have good internet (for now) here in Tortuguero, so we will try and get a couple of posts done tonight! The trip is going amazing so far. Wait until you see the pictures from today’s walk up the side of an extinct volcano, and our boat ride thru the Tortuguero canals. Spectacular! All students arrived today via their flights from all over the country (including Hawaii!). 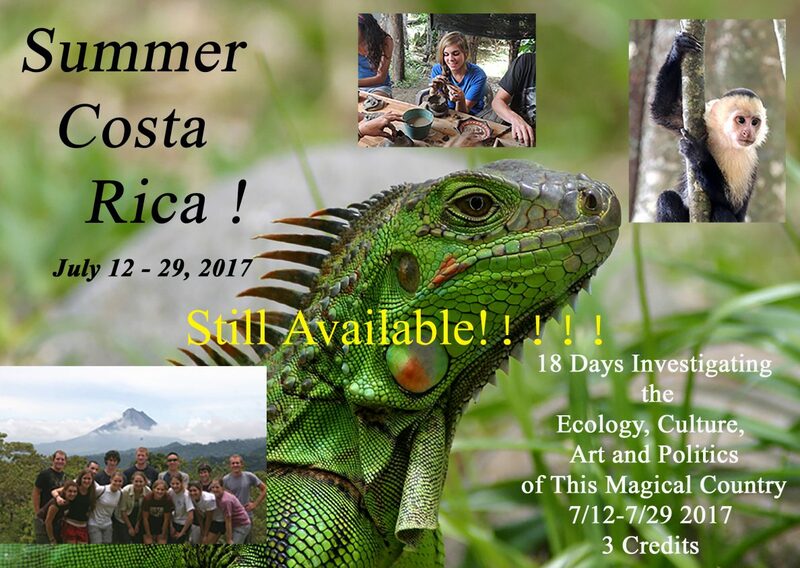 Students spent time unpacking, getting settled into the Hotel La Rosa de America, and taking pictures of the beautiful flowers, birds, and even a Cane toad Rhinella marina. Lunch was at a nearby restaurant (see pics attached) and the afternoon was spent getting acquainted, getting some very important safety tips, and learning about the History of Costa Rica, from our esteemed MVI guide, Mark Wainwright. Dr. Auger then outlined some of the course items on the trip, including the importance of keeping a field notebook as part of the course grade, and an outline of the potential project format. Students were provided the Trip Itinerary and the Course Syllabus, and more details will be provided as the course gets underway tomorrow. Tomorrow we head to Tortuguero on the Caribbean coast for two days, where students will be immersed in a tropical coastal environment, tour the Tortuguero canals by boat, explore the village of Tortuguero, and learn about the various species of nesting marine turtles from the staff at the Sea Turtle Conservancy. We hope to be able to witness the nesting process, which is purely a timing situation, so hopefully our group’s timing will be good! It is an amazing process to witness. Please enjoy today’s pictures below from the various animals and plants we photographed today at the Hotel, including the Cane toad mentioned above, an arachnid, butterflies, a cool lizard that we think may have been a Ctenasaur , various other plants, and our favorite, a Rufous-naped wren Campylorhynchus rufinucha near his/her nest. We even took 2 pics with our FLIR thermal imaging camera … a butterfly and the Cane toad! Continue to stay tuned in, as we journey through the beautiful country of Costa Rica!